Shopping in Las Vegas is an experience, not a necessity! High-end brand names, cheap outlet malls, crazy gifts, world's largest Bass Pro, entire stores devoted to candy and coca-cola, the city has it all! What's even more fun - many Las Vegas malls go out of their way to attract you, offering spectacular shows - fashion, statues, lights and whatnot! Read on to find out where to shop in Vegas. Review: The newly opened Linq offers a quintessential experience of shopping in Las Vegas right on the Strip. This outdoor shopping and entertainment plaza offers a staggering variety of shopping, entertainment and dining options. 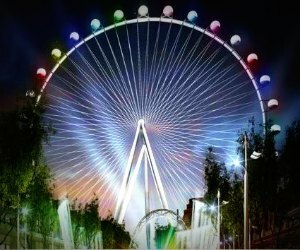 The first thing you'll notice when you visit The Linq is the High Roller. This observation wheel is located at the heart of the mall and offers you spectacular views of the city from 550 feet up in the air. Surrounding the observation wheel are many bars, restaurants and stores. For nightlife, live performances and bowling, head to the Brooklyn Bowl with it's over the top entertainment experience. With valet parking and a pedestrian walkway access, The Linq is also easily accessible. A fun shopping center built from old containers makes an interesting Las Vegas shopping experience. 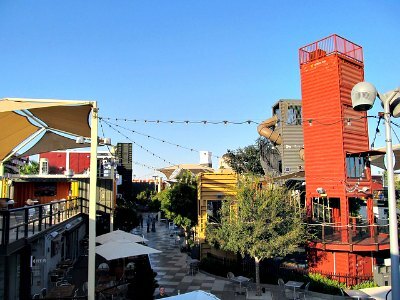 The Downtown Container Park is an open-air shopping venue which makes a great day out for the family. The kids will enjoy the playground which offers a 33 feet tall slide and massive foam blocks. Live entertainment shows are held regularly with special family shows during the holidays and late night weekend concerts for the young. Each shop is held in a container and they offer a range of products from boutique clothing stores to fine dining restaurants, hot dog take-out stands and art galleries. The speciality stores are known to keep items that cannot be found anywhere else, making this a shoppers paradise. Shopping here will give you a feel-good vibe as you will be supporting small business owners who have a passion for what they do. Address: 3720 S. Las Vegas Blvd. 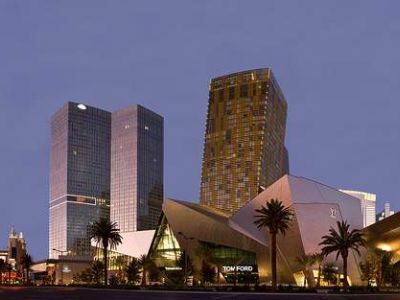 Review: Crystals at CityCenter offers you a complete experience of high end shopping in Las Vegas. Featuring a selection of fine retailers, this massive mall has ample parking facility, beautiful sculptures and even a park between the mall and the Aria hotel where you can enjoy some quiet time and relax when you're too tired to walk. 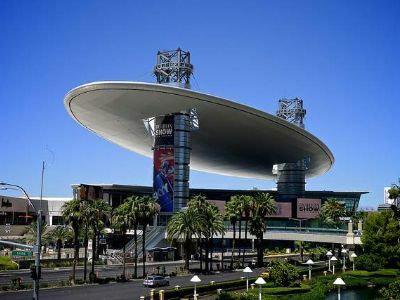 Be prepared to spend an entire day at this mall because it has a lot of shopping opportunities, water displays and spectacular architecture. You'll also find a flower carpet, a tree house and water features inside to keep the kids entertained. The water features are particularly impressive with neon lights, ice columns and contemporary design. It offers you all the options you need for shopping, nightlife and dining. 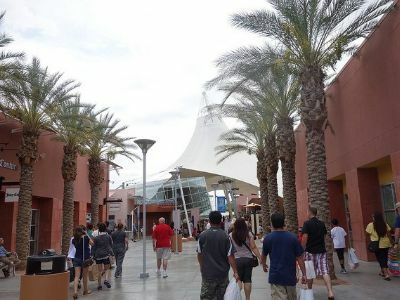 Review: The Fashion Show Mall offers a luxurious, indulgent experience of shopping in Las Vegas. Spread over a massive area, this large mall on the Vegas Strip offers entertainment and shopping at its best. The façade of the mall itself is covered with large screens. What makes the Fashion Show Mall stand out from others is its fashion show. The retractable runway pops out for a free fashion show to highlight the merchandise sold at the stores in the mall. The Cloud is a large canopy that has become a very well recognized symbol in the city. This unique canopy is in fact a media screen with eye catching advertisements and spectacular lighting. Throughout the mall are several comfortable seating areas where you can relax and rest. Review: The Forum Shops at the legendary Caesars Palace provides a whole new meaning to the word "shopping" in Las Vegas. Once you enter the mall, you'd probably want to spend the entire day there. Other than the huge selection of brands, this mall also offers a number of excellent entertainment options, eye-catching décor and features that will keep you occupied for hours. The Atlantis Fountain Show should not be missed. With a beautiful water and fire show and talking statues, it is definitely quite entertaining. Another great entertainment option at the Forum Shops is the massive aquarium where you'll be able to see a wide range of sea creatures. A very unique feature of this mall is the spiral escalator in the massive three level area that will take your breath away! 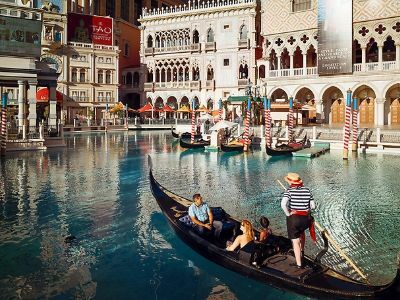 Review: The Grand Canal Shoppes at The Venetian will transport you to romantic Venice as soon as you set foot inside. 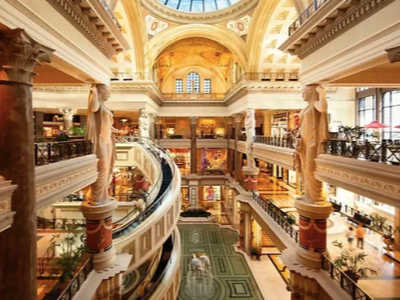 Featuring grand architecture, gorgeous canal, gondolas, waterfalls and more, this is definitely not your average Las Vegas mall! The highlight of this romantic mall is the Grand Canal where you can enjoy a romantic ride on a gondola and kiss under the bridge. You can also enjoy performances by dancers and costumed opera singers to soak in some culture while you are shopping in Las Vegas. The atrium is another highlight of the mall with its colorful waterfall and the spectacular gardens with lush foliage and beautiful lighting. The ceiling is painted blue to further provide you an illusion that you're outdoors. Review: Le Boulevard at Paris is just as charming and European as it sounds, you would forget you are shopping in Las Vegas, where fakery is an art form. With painted high ceilings, cobblestone streets and quaint shops, this mall is much like a charming Parisian village. As you stroll through the retail areas you'll feel as if you've been transported to France. Designed like a boulevard, this mall features beautiful cobblestone streets that are lined with charming boutiques and stores. 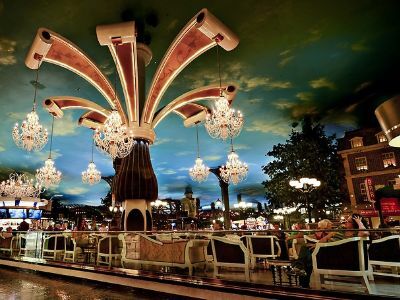 Located just behind the casino and hotel, the lobby of the casino is spectacular with its luxurious décor and chandeliers. If you're visiting just the mall for shopping, there is a convenient parking garage and separate entrance. 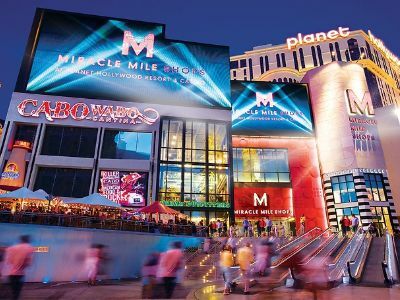 Review: The Miracle Mile Shops at Planet Hollywood offer glamorous, futuristic feel during shopping in Las Vegas - an experience that will definitely leave you asking for more. The interiors are designed to modern and eye-catching with the bright lighting, the indoor fountain show, Vegas inspired art work and a modern ceiling. Outside the mall you'll find a façade that features a massive LED sign that grabs your attention with its eye-catching image and the impressive sound system. The water fountain show inside the mall is definitely what most people visit for. It features stunning lighting, music and colorful fog with water shooting high up in the air. Address: 6605 S. Las Vegas Blvd. Review: The Town Square is a spectacular, massive outdoor shopping mall with cobblestone walkways, beautiful greenery and global architecture. Designed to offer an elegant, old school shopping experience, this mall was inspired by architecture from around the world so you'll find Spanish and Mediterranean influences at every corner. Once you stroll up the walkways you'll leave the bustling pace of Vegas behind and step into a relaxing tourist mecca. If you have kids, bring them to the children's park where they'll find lots to do while you are shopping in Las Vegas - including a tree house and garden maze. For adults, there is a movie theater and plenty of options for shopping, dining and nightlife. 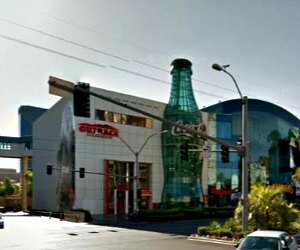 Review: If you're a fan of Coca Cola, head to the Coca Cola Store for a fun experience of shopping in Las Vegas. This unique store offers you everything Coca Cola from apparel and home décor to collectibles and recycled gear. The store has a collection of beautiful retro collectibles that include gorgeous retro tins, diecast Coca Cola cars, piggy banks and retro collectible bottles. With its collection of furniture, clocks, signs and accessories, the store also offers a good selection of home décor items. The Coca Cola Store also has a very large collection of clothes and accessories for men and women, footwear as well as accessories for your serving table and kitchen. 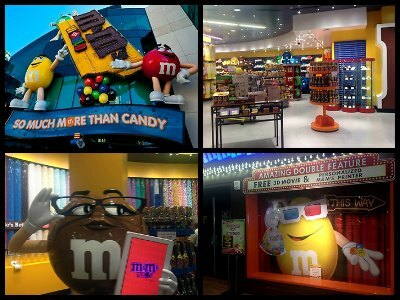 Review: While you are shopping in Las Vegas with your kids, drop by The M&M's World, offering a treat for all your senses. This fun store has been attracting thousands of families over the years. Whether you're a kid or an adult, you'll appreciate the distinct variety of merchandize offered by the store. You'll be able to shop for M&M souvenirs, candy dispensers, collectibles, games, clothes as well as décor accessories for your home and office. The classic candy dispensers are not to be missed. These gorgeously designed fun dispensers are definitely a hit with the kids. You'll also find a wide range of colorful, fun accessories and décor items to give your home a colorful touch. Kids love the collection of games, toys and M&M inspired clothes available at the store. Review: If you've seen the show 'Pawn Stars' on the History Channel, the Gold and Silver Pawn Shop will definitely be a really interesting store to visit while shopping in Las Vegas. This pawn shop is not just home to thousands of interesting, unique and rare items but it is also owned by the stars of this incredibly popular store. Located in a 1934 building on the Vegas Strip, you'll find rare artwork, antiques, jewelry and much more. From a 1963 Amazing Spider Man Comic and WWII Fighting Knife to products featured on the show, there's much to explore and find at the Gold and Silver Pawn Shop! Review: Inspired by the pop culture of Las Vegas, Bonanza Gifts is the World's largest gift store and a lot of fun to explore while shopping in Las Vegas! 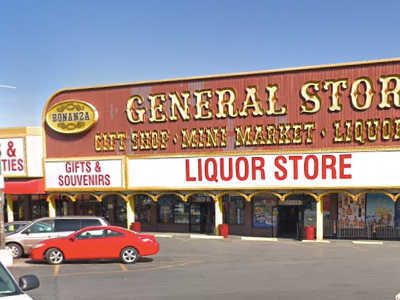 If you're looking for fun and unique souvenirs to take back home from your Vegas trip, Bonanza Gifts definitely has a lot of options. From games and home décor to books and pillows, you'll find just about anything over here. You'll also find some incredibly unique gifts here like their bestselling item, Polly the Insulting Parrot. This motion activated parrot is funny, rude and foul-mouthed! You'll also find everything Vegas -inspired to remind you of your trip to the Sin City! 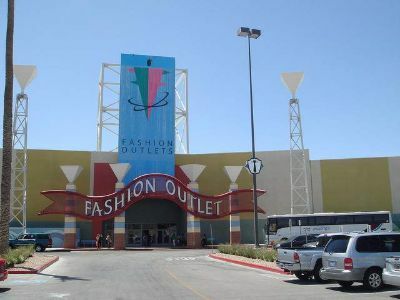 Review: Fashion Outlets is an outlet mall in Las Vegas, featuring more than 100 stores, great discounts and a good selection of restaurants for your day out shopping. The mall has a circular design that makes it easy to explore the stores and find what you need quickly. There are plenty of spots to catch your breath and relax. The food court inside offers plenty of choices and has something for everyone. What makes this mall so popular with shoppers is the discounts it offers. With plenty of promotions and discounts, you'll be able to save up to 75% if you are shopping in Las Vegas on a tight budget. 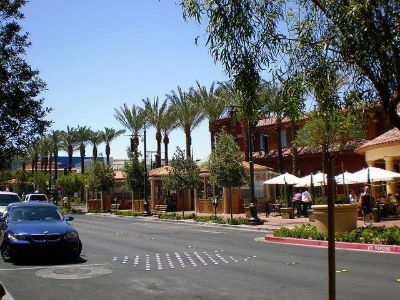 Review: The Premium Outlets at Las Vegas- North and South offer a selection of some of the most popular labels like Tommy Hilfiger, Polo Ralph Lauren, Michael Kors, DKNY and more along with great deals and savings. Featuring hundreds of shops, you'll have plenty of options to select from while shopping in Las Vegas. Both of the malls are quite large and will require you to walk quite a lot. The food courts offer a selection of number of popular eats. For kids, there is a carousel next to the food court at Premium Outlets-South to keep them occupied. You'll also find amenities like taxi services, information centers and stroller rentals.